Blue Bird's alternative fuel transit buses provide “affordable public transportation” for Michigan community. 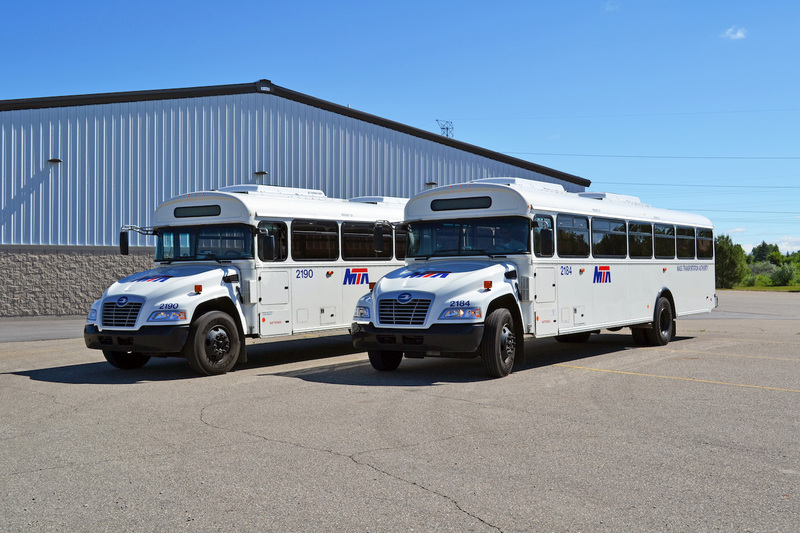 The recent delivery of 16 buses to Flint Mass Transportation Agency signals the largest rollout of Blue Bird Vision Propane buses for commercial use. We’re bringing decades of experience in school buses and expertise in affordable, alternative fuel buses to transit agencies and public transportation riders. The recent delivery of 16 alternative fuel buses to the Flint, Michigan Mass Transportation Agency signals the largest rollout of Blue Bird Propane Visions for commercial use. According to Flint MTA, the new alternative fuel buses cut costs, reduce harmful emissions and take advantage of a domestically produced fuel. Compared with the diesel buses they replaced, each bus will cut down on 800 pounds of nitrogen oxide and 35 pounds of particulate matter annually. “Blue Bird Propane Visions buses allow Flint to provide green, affordable public transportation while saving taxpayer dollars,” said Ed Benning, general manager and CEO for Flint Mass Transportation Agency. 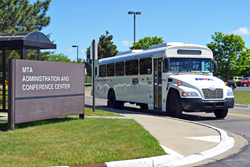 Flint MTA purchased the buses with Federal Transit Administration funding. The FTA New Model Bus Testing Program (known as Altoona testing) rates new buses on safety, structural integrity and durability, reliability, performance, maintainability, noise and fuel economy. The commercial version of the Blue Bird Propane Vision, which comes with a 5-year, 100,000-mile warranty, is Altoona-test rated for 350,000 miles or 10 years. Each 39-seat bus is equipped with a 6.8L Ford engine, a ROUSH CleanTech fuel system and a 100-gallon fuel tank. “In addition to providing cleaner operations, the propane autogas fueled, medium-duty buses cost only one-third of the price of heavy-duty transit buses, so they are an extremely cost-effective way to augment our transit bus fleet,” Benning said. Flint MTA locked in a yearlong rate of 75 cents per gallon for propane autogas, which helps the agency budget fuel costs. With the current federal alternative fuel tax credit, their per gallon cost is 39 cents. The agency averages 20,000 miles per month on the buses, using them for six hours daily during peak service route times. Blue Bird (Nasdaq: BLBD) has sold more than 550,000 buses since its formation in 1927 and has approximately 180,000 buses in operation today. In the early 1990s, Blue Bird developed a plan to build on its legacy and heritage in the school bus market by providing customized, innovative and economical buses to all sectors of the commercial market, including transit, shuttle and tour/charter. Blue Bird’s longevity and reputation in the school bus industry have made it an iconic American brand. Blue Bird distinguishes itself from its principal competitors by its singular focus on the design, engineering, manufacture and sale of buses and related parts. Blue Bird is recognized as an industry leader for bus innovation, safety, product quality/reliability/durability, operating costs and drivability. In addition, Blue Bird is the market leader in alternative fuel applications with its propane-powered and compressed natural gas-powered buses. Blue Bird manufactures buses at two facilities in Fort Valley, Georgia. Its Micro Bird joint venture operates a manufacturing facility in Drummondville, Quebec, Canada. Service and after-market parts are distributed from Blue Bird’s parts distribution center located in Delaware, Ohio. For more information on Blue Bird Commercial buses visit http://www.bluebirdcommercial.com. Compared to the diesel buses they replaced, each of Flint MTA's propane-fueled buses will reduce 800 pounds of nitrogen oxide and 35 pounds of particulate matter each year. Blue Bird has sold more than 550,000 buses since its formation in 1927 and has approximately 180,000 buses in operation today.